Thermal Roll 80mm x 80mm: Why Is It So Popular? Home/Thermal Paper/Thermal Roll 80mm x 80mm: Why Is It So Popular? The 80mm x 80mm thermal roll is among the most used printer paper rolls in the world. From Europe to America and Asia to Africa, the thermal roll is a popular accessory in the printing industry. Most printers are manufactured to be fitted with the 80mm x 80mm thermal roll. It is the paper roll used in ATM machines, cinema tickets, shopping malls, and bus ticketing rolls to mention just a few. So what could be the reason behind the 80x80mm thermal roll’s popularity? A closer look at its key features provides an explanation to this query. The 80mm x 80mm thermal rolls are of superior quality and fit into many thermal docket printer brands. Popular brands that use the roll include Epson, Citizen, Posiflex, Samsung, Fujitsu, Axiohm and Star printers. Although not officially, the 80x80mm thermal roll is adopted as the standard thermal printing roll. Its use for different applications makes the paper roll so popular. Length is a critical aspect when evaluating paper rolls. Roll length translates directly to the number of receipts that can be printed. Longer paper rolls mean more receipts can be printed thus creating value for money. 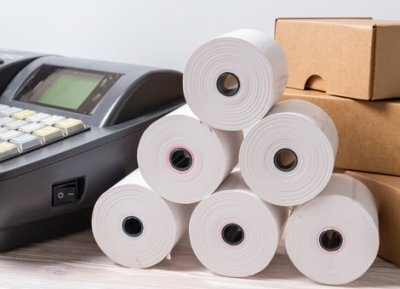 Printing a high number of receipts per roll reduces the frequency of changing paper rolls thus improving efficiency. The 80mm width of the thermal rolls is long enough to serve for longer periods. However, roll paper prices rise in direct proportion to the length. Printing rolls should be able to retain the information printed on it for long periods. This is determined both by the printing technology and the type of paper used. While thermal printing can produce durable images, most paper qualities do not match up the technology. The 80x80mm thermal roll has the capability to retain an image for 5-7 years. The ability to retrieve printed information after long periods makes it the favorite roll over its opponents. The printing industry has evolved greatly since the time of mechanical printing head technology. Ink-jet, thermal and laser printers are among the later developments and each has its own pros and cons. Thermal printers are the fastest among the three and produce superior quality text and graphics. The 80mm x 80mm thermal roll is impregnated with heat reactive chemicals to produce high-quality graphics at specific temperatures. Thermal printers are expected to dominate the market due to their superior printing qualities. Production of the 80mm x 80mm thermal roll is a rigorous process that involves coating the paper with special chemicals. The paper can either be coated on one side or on both sides. The final product is a quality thermal roll that perfectly matches the requirements for thermal printers. Its quality prevents malfunction of the thermal printer head as the production of paper dust is minimized. It is unarguable that the 80mm x 80mm thermal roll is the most used printing paper in the world. This is due to the wide use of thermal printing technology that beats its opponents in text quality and speed. The 80x80mm thermal roll further has better image retention qualities compared to other paper types. Thermal printing saves on paper as printing is based on need. With the leading printer manufacturers adopting it as the standard paper size, the future for 80mm x 80mm thermal roll is bright.